Electronics have taken over the marketing world in recent years. Many people are very focused on their social media influence, because it is so fast paced and constantly changing. But it is so vital to remember the importance of print marketing. Print marketing opens up a door to so many different audiences. This is extremely important because as a marketer and an advertiser, you want to reach as many people as possible. Believe it or not, not everyone uses social media! There is definitely a group of people, regardless of age, that choose not to spend as much time using their phones and devices. These people still have the opportunity to be reached! Whatever your business is trying to advertise to the public can be printed on a newspaper, billboards, magazine, etc. These are great resources because once they are printed, they are there forever. If someone is picking up a dated magazine in an office, they can still see the advertisement, and may be inclined to contact your business. Make your advertising stand out by adding graphics, designs, and adding verbiage that makes your company stand out. Another thing that you should consider is that the internet may not always be a reliable source. What if there is a glitch, or something goes wrong and your business cannot depend on social media and the internet? Remember to have a marketing plan in place if that occurs. Know where you can reach your audience, what the next move would be, and be confident in the fact that your business can strive with or without the help of the internet. Need help advertising, or interested in learning how to target your audience for your business? 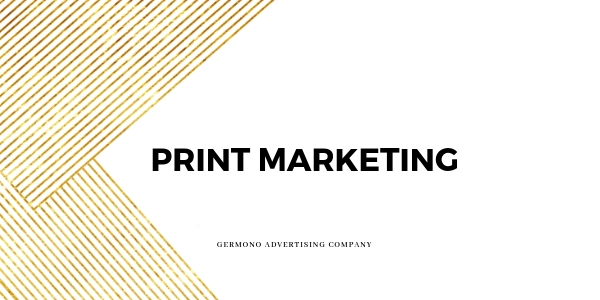 Contact Germono Advertising Company by emailing me at anna@germono.com if you are interested in learning more about Print marketing!